I just can’t believe how well things are going for AdventureMike’s. I’m already booked and filled for more than half the summer and I just started to take reservations. I expect to fill up a lot of the remaining spaces next weekend during SunFest. Stop by my photography booth if you go! I may have to buy a larger real “Pirate Ship” for next year at this rate! Not sure how I’m going to take everyone who wants to go otherwise. For those of you who haven’t filled out your registration forms yet please make sure you download them and get them in to me as soon as possible. I don’t want anyone to lose their space! For any of you who may be interested, I’m now accepting payment on line and you can do that by clicking here. You can order multiple weeks online by adjusting the quantity and clicking ‘Update Totals’ before checking out. If you need to call, I can be reached at 561-324-1892. Summer is right around the corner so get those registrations in. I can’t wait to begin the Adventure and for us to have the time of our Life!!! Looking forward to seeeing you all! We are going to have a Great Time full of Adventure!!! I’m excited about this up coming Summer Camp Season!! The first Adventure Session begins June 2nd, that’s right around the corner, and to say I just about can’t wait is an understatement!!! I am so looking forward to it and I know that all of us are going to have a fantastic time!!! I’m going to personally see to that!!! Right On! For those of you who have joined me in the past, you know the kind of Fun and Excitement that’s in store. We are going to have honest to goodness Adventure Sessions from start to finish!!! 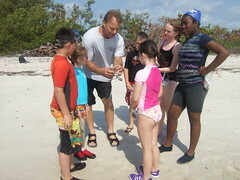 In between snorkeling at the Rock Garden, swimming in the Deep Hole, exploring the Big Sandbar and seine netting behind Munyon Island, we are going to be learning cast netting and water safety, enjoying crab trapping, nature walks, eco tours and more! As if spending a day out boating isn’t enough fun all by itself!!! And Best of All, we will be spending one full day a week fishing in my favorite secret spots where the action can be non stop from start to finish. AND I MEAN FROM START TO FINISH!!! Just ask AdventureCarolyn from last summer! 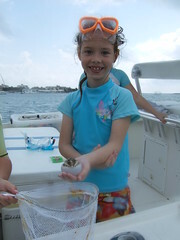 She caught 71 snappers, grunts, pinfish, porgies, yellowtails, spot-tails and groupers, etc. all by herself! And in just one outing of fishing!!! Had to quit cause she couldn’t reel in another fish! Everyone else caught around 50 or so each. What an unbelievable day! 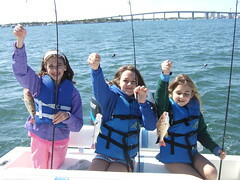 I’ll bet we boated and released over 350 fish in under 4 hours by 5 young adventurers. I may never have another day like that, but I can only hope!!! Maybe this Summer a lucky Adventurer can break that record! I know we are going to try! 1. Download your registration forms. 3. Include a check or pay online. Just got back in and wanted to drop a quick post on the days adventure since we had such an unusual encounter with a Leatherback Sea Turtle. A very rare and unusual occurrence and a tremendous lucky encounter for all of us!!!! I won’t forget this day for quite a while if ever! 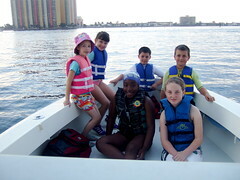 We boarded the boat as usual at the ramp and the regular group of us were joined by McKenzie’s sister AdventureMegan. And off we went. Little did we know that just a minute or two later we would be having an incredible encounter with an extremely large Leatherback Sea Turtle in very shallow water INSIDE the Lake Worth Lagoon! Leatherback Sea turtles are the worlds largest living reptiles and can be over 7 feet long and weigh upwards of 2000lbs. Its the only sea turtle that lacks a hard bony shell or carapace. Leatherbacks lack the crushing chewing plates characteristic of sea turtles that feed on hard-bodied prey. Instead, they have pointed tooth-like cusps and sharp edged jaws that are perfectly adapted for a diet of soft-bodied pelagic (open ocean) prey, such as jellyfish and salps. A leatherback’s mouth and throat also have backward-pointing spines that help retain such gelatinous prey. They are one of the rarest sea turtles to be encountered here, and were we LUCKY!!!. We had just passed underneath the Blue Heron Bridge heading east along the sandbar when out of the corner of my eye I saw a tremendous swirl in the water just a few feet off the beach from Phil Foster Park. I looked closer and noticed a tremendous head lift up out of the water and take a quick breath. I recognized it instantly as that of a Leatherback Sea Turtle and was quick to shout out to the kids to take a look. We were so lucky!!! 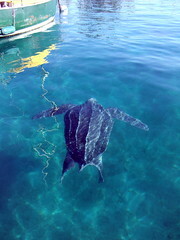 I have seen only 4 or 5 leatherback sea turtles in my life and always far offshore in the Ocean. Never within the intercoastal waterway in shallow crystal clear water. I know this is the time of year the females come ashore to lay eggs and somehow I believe this one may have mistakenly swam in the inlet on its way to the beach and was looking to find its way back out. How wonderful for us, this will probably be a once in a lifetime encounter for all of us!!!!! I have lived here my whole life, spent thousands of hours on and under the water and have never seen nor heard of one being seen where we were! 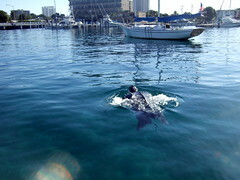 We followed her from a safe distance behind as she hurriedly made her way into the deeper water of the Palm Beach Inlet and headed back offshore. We were so excited and shouts of joy from all of us could be heard every time she came up for a breathe. I had a chance to take just a few photos before she disappeared. I didn’t want this moment to ever end!!! It was magnificent for all of us and I will forever feel blessed that we were given this rare and unusual opportunity!!! Still smiling thinking about it and how special for this group of Adventurers to witness such a magnificent and beautiful animal. I know all of us will never pass by this same area again without thinking of this moment and how special we felt at that time. WOW!!! still comes to mind! AdventureMickey I’m sure will never forget this week, first time on a boat, first time fishing, first fish ever caught, first Leatherback Sea turtle 5 feet from his nose…. Does it get any better than this? Hard to imagine… How cool is that? After this encounter we decided to take a run down the Ocean side of the beach along palm Beach Island. It was an absolutely flat calm day with crystal clear water. Absolutely beautiful and just perfect!! We spent an hour shelling and snorkeling along the beach and found some beautiful Scotch Bonnets, Measel Cowries and some nice pectens. Really nice finds if your a sheller like me! From here I decided to take the group for a quick run out to look for flying fish to show AdventureMickey and the group. We spotted a few and on the way back to the Inlet we saw 2 loggerhead sea turtles relaxing on the surface and catching their breath before taking another deep dive to the bottom. It was really great to see 2 species of Sea Turtles in one day and up close and personal at that! It just doesn’t get any better than that for a new group of Adventurers! From here we took a quick snorkel at the Rock Garden, found some really nice green mantis shrimp and coral crabs under rocks and went to the Big Sandbar and spent the last half hour playing in the shallows, looking for starfish and just having FUN! When it was time to head back, I can tell you nobody was ready to go, not even me. We were having too much fun and today was such a cool day we didn’t want it to end!!! One thing I just love about doing this camp is you just never know what you might discover. Each day seems to hold a new treasure waiting to be discovered and shared, and when I see the smiles on the kids faces and know they are having the time of their life, I just LOVE IT!!!! Leaves me longing for more, and one things certain…. I can’t wait till tomorrow!!! Another day of Adventure!!! Another day in PARADISE!!!! Another day sharing what I love MOST!!!! Its going to be GREAT!!! RIGHT ON!!!!! Next time I hope you’ll join us!!! I just wanted to drop you a quick post and let you know that registration for my 2009 AdventureMike’s Summer Camp begins NOW!!! Please don’t wait too long to register! I know the spaces will fill up quickly as usual and I would love for each one of you to be able to join me again!! The first week begins June 2nd, 2009 and that’s right around the corner… I just can’t tell you how excited I am and just how much I’m looking forward to having another unbelievable Summer of Fun, Excitement and ADVENTURE with all of you. Last year had to be the best Summer we have every had, and this year I’m planning on outdoing it! It’s going to be GREAT!!! I Guarantee it!!! I’ve been scouting out many new locations and have come up with many more ideas to make this years camp sessions as absolutely fun, exciting and educational as possible. I know that all of us are going to have a fantastic time!!! I’m going to personally see to that!!! I promise!!! For those of you who have joined me in the past, you know the kind of Fun and Excitement that’s in store. We are going to have honest to goodness Adventure Sessions from start to finish!!! And we will be having “live updates” thru out the day on our adventures so you, the parents, can tune in and join us in our discoveries and share in our excitement… More to come on that! Come join us, and be a part of the Adventure!!! See you soon!!! Today was a bit windy and cool so I decided to have our fishing day a day sooner than normal instead of getting wet on the coldest day of the session. We loaded up and arrived at my secret GPS #’s and dropped anchor. We didn’t hang exactly perfect over the ledge like I wanted but we gave it a shot anyway. Only caught 2 fish in the first couple of minutes so I decided to pull up anchor and move a few feet further to the north, and I mean just a few feet! Didn’t want to waist any time with slow action when I know how good things can be. From that moment on, once the baits went down, the rest was just a blurr! Didn’t even have time to look at my watch, eat, drink or catch my breath, and just the way I love it! 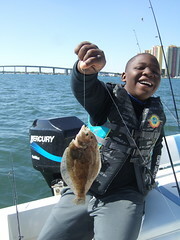 GO go go go go…..
AdventureMcKenzie was the first to catch a fish, and a nice big lane snapper at that! 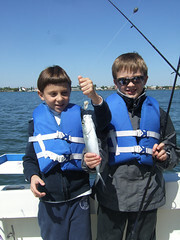 AdventureMickey, who had never been boating or fishing before in his life, caught the next. A big fat Sailor’s Choice! Right on Mickey!!! You should have heard him yell, “I CAUGHT A FISH, I CAUGHT MY FIRST FISH!!!! and seen that great big smile of his! I will never forget it! Makes me feel extra special to know he caught his very first fish with me and I was smiling from ear to ear too! Love it when things come together like this! I know he won’t forget it either, including the flounder, lane snapper, mangrove snapper, mutton snapper, blue runner, tomtates, Cesar grunts, spot-tails and margates, etc he also caught non stop after this. Talk about your first and only day of fishing…. WOW!!! He’s going to be spoiled now! Along with Mickey, AdventureJoe and Matthew were doing the same and having the same non stop action! Just like AdventureRachel, Maggie and McKenzie! Everybody was catching fish as fast as I could bait a hook. If I would have had help today, we might even have beat the all time record set for AdventureMike’s July 10th, 2008 of over 350 fish boated and released in under 4 hours! I have never seen so many nice snapper being brought in non stop like this! I couldn’t keep track of who caught what, and how many each as I released them, but I think AdventureMckenzie may have boated the most fish over all. That girl knows how to FISH! And don’t let her small size fool you either. My moneys on her!!! I think she caught the largest assortment of species too. Even a nice big yellow porkfish! Just a beauty! What a great day!!! I can’t even begin to make guess as to how many fish we had on that we didn’t hook or lost just at the boat. And like I said, I have no idea what made the action so extra special, or what made the fish bite like they did, but I know one thing for sure, not one of these adventurers will ever forget this day, and neither will I! We had fun!!! We had a blast!! ! We had another once in a lifetime day!!! And, best of all, we had a story to tell!!! It may sound like a “fish story” to some, but we all know differently! WE LIVED THE ADVENTURE AND WE SHARED THE SMILES, THE LAUGHTER, THE EXCITEMENT!!! If you saw the smiles on the faces like I did today, you would never forget it either!!! Thank you !!! And Mickey, Congratulations on catching your first fish, and the next 30 or more after that too. You did GREAT!!! I just can’t wait till my Summer Camps begin on June 2nd!!! I don’t want this much fun to stop!!! I don’t think I can wait that long!!! How about you? God, I love my job!!!! How can we have this much fun!!! Welcome back! We just finished up the first two days of our first Spring Break Adventure Session and let me tell you we had a blast! It was just great from start to finish! As Usual, and just the way I love it!!! AdventureSheri and I were joined by AdventureJake, Allison and Noelle from last Summer and three new Adventurers, AdventureJada, Rio and Alex. I love arriving at the dock with everyone raring to go and eagerly awaiting for the days adventure to begin, and hearing the excitement in their voices and seeing the smiles on their faces when we load up. It makes for a perfect day! We began the day a little differently by motoring over towards the Power Plant to take a quick look to see if any Manatees might be resting in the warm shallow water near the out flow pipes. AdventureJada was just dying to see one and I wanted to make her day. We gave it about 10 minutes and didn’t see any this time so we headed to a nearby beach to do a little exploring. We anchored the boat right on the beach and hopped out and immediately found a nice big Spotted Sea Hare swimming in the shallows. The neat thing about these is they sometimes release a dark purple cloud of ink when disturbed and much to the excitement of the gang, this big fellow released a nice batch right on cue. It was great to see the smiles then! Everyone took their turn gently touching the Sea Hare and then we moved further down the beach to check out some of the large stands of Nicker beans we found during AdventureLauren’s birthday party last weekend. We stopped and I picked up a few thorny pods to show them the tiny gray beans inside and everyone wanted to keep a bean or two for “good luck”. They are commonly called “Lucky Beans” and the anti-malarial drug Quinine is still made from the gray husks of these beans. You have to keep away from the branches and leaves though since they have numerous hooked thorns to snag both you and your clothing! The first time I found this out when I crawled though the branches left a lasting impression. Ouch!, but it was still fun! From here we headed to the Rock Garden to do some snorkeling and search the shallow rocks for Hermit Crabs. AdventureJake and Alex came back with some big Coral Crabs while the rest of us were busy finding blue-legged hermits and red-banded hermit crabs. We were having a blast! When I pulled one of the large female coral crabs out of the net to show the group her eggs under her abdomen, she latched onto my finger and hung on for dear life! I wasn’t sure who had who, but I know this group of Adventurers loved seeing that crab hang on to my finger for at least 5 minutes! We were all smiles by then!!! AdventureSheri kept a watchful eye over the girls busy in the shallows finding all kinds of hermit crabs and captured most of the days adventure on film for the rest of us to enjoy later. Nice job!!! AdventureJake found a sharptail pufferfish and was able to catch it in a small net and bring it back to show us. Not an easy feat for those who haven’t tried this! We were delighted to watch as it puffed up full of water and more than tripled its size. We took a couple of quick photos then released it unharmed and then headed back to the boat for some drinks and snacks. While they were eating, I moved the boat to a nearby shallow sandbar and got in to look for some lizard fish buried in the sand to show everyone. 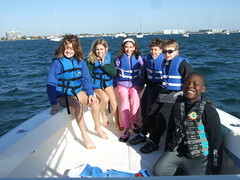 AdventureNoelle, Rio, Allison and Jada were quick to follow, while AdventureAlex and Jake set the anchor in the shallows. Somehow this searching for lizard fish turned into “netting” AdventureMike and you should have heard the laughter then after I was “netted” and they piled a giant sand ball right on the very top of my head. They were laughing like crazy, having a great time and smiling from ear to ear!!! And that was the perfect way for us to end the day!!! We laughed the whole way back to the dock thinking about how much fun we had! And I know one thing for sure, I just can’t wait till tomorrow! We are going to have a blast, do some seine netting, short-spined sea-urchin collecting, crab trapping, snorkeling, an Island hike and maybe even visit Starfish Prairie along the way. And who knows what else… As if a day out boating isn’t fun enough all by itself!!! It just doesn’t get any better than this!!! Stay tuned, or better yet, come join us!!! It’s time to get outside and live life to the fullest!!! I know we are. Let’s Go Have Some Fun !! !